Barcelona were hailed as La Liga champions-elect in the Catalan media after their 1-0 win at Real Madrid on Saturday. 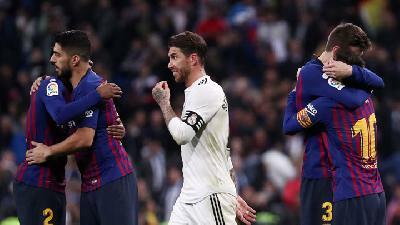 Real Madrid eased their recent troubles by securing a therapeutic 3-0 home win against Leganes in the first leg of their last-16 Copa del Rey tie. Gareth Bale sustained the injury during Real Madrid's 2-2 draw at Villarreal in La Liga on Thursday.